The club are sad to announce that Geoff Harrison, former OWs umpire and 1st XI scorer, passed away on 22nd December at his home in Dartford after a sudden deterioration in his health. Geoff moved down in the mid-80s. Geoff had connections with Hayes and Romany Cricket Clubs as well as the Old Whigitftians. There will be a Service of Thanksgiving for Geoffrey Harrison at 12:30pm on Friday 23rd January at Bromley United Reformed Church followed by a private committal, for close family, at Eltham Crematorium. The club are sad to announce that OWCC and Paralytics stalwart Nick Cooper passed on Saturday 29 November. Our thoughts are with his brother Nigel and the rest of his family at this very sad time. Please find a tribute to Nick here. 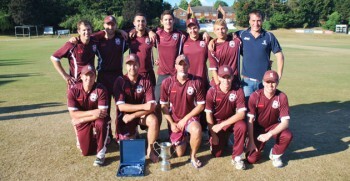 Reigning National T20 Champions Wimbledon have won the Surrey T20 competition for a record 4th time and now progress into the ECB National Competition where they will play the winners of the Kent, Hampshire and Sussex leagues. In a thrilling day on Sunday 28th July, at the Whitgift Sports Club ground in South Croydon, attended by over 300 spectators, Wimbledon beat Sunbury by 6 wickets. Sunbury were bowled out for 125 in 20 overs and Wimbledon comfortably chased down the target, scoring 128-4 in 18.3 overs, with former Hampshire batsman Chris Benham hitting 50. President of The Ryman Surrey Championship Andy Packham, presented Neil Turk, captain of Wimbledon, with the trophy, congratulating him and giving him the whole-hearted support of the entire county in the National Rounds on August 11th. Postscript: Wimbledon won the national competition at the Kia Oval on the 13th September. They beat South Wilts, Blackheath and Frocester to get to the finals days before winning in bowl outs against both Banbury and Ormskirk at finals day. Stuart has written a pre-season message which includes an update on the work done on the grounds during the winter and details of pre-season friendlies. To read it, click here. Members will be saddened to learn that Chris passed away on 21 February at University College Hospital. He was 68. Chris was one of the real characters of the OWCC, playing for a number of years as a slow left arm spinner after leaving Whitgift in 1962. Together with his wife Janet, Chris was a regular supporter of the Club at nearly all our events, weekend games, Cricket Weeks and Dinners. He acted as a Duty Officer for many years and was also an official guide at ‘The Home of Cricket’, Lords. Our thoughts are with Janet, John and Rosie at this very sad time. Well done to Martin. He played on Saturday 19 May for the 4th X1 against Churchleigh, extending his continuous playing record for the club to 50 successive seasons! Rumour has it that Martin has regained his thirst for regular 4th X1 action and is now planning a full-time comeback as skipper next year! Members will be saddened to learn of the death of Roy Sattar at the age of 89 on 9 May after a short illness. It was only last week that he was in touch with the Chairman seeking news of the new season. Roy was an Olympic cyclist for his native Barbados before joining Addiscombe in 1966 and, when introduced to his new skipper before his first game in the 2’s announced , “Well man, I open de batting, open de bowling and if you want I’ll keep wicket!” Roy took up umpiring and was involved with OWCC from the early 1990’s for both the Saturday 2’s and the Sunday 1’s/Surrey Trust side. Roy was an early umpiring pioneer bringing in his own ‘yellow card’ system shortly after the concept was introduced into football. Roy also turned out occasionally as a player for us in his early days at Croham Road, opening the bowling in one inimitable spell against Eton Ramblers for the Sunday 1’s when aged almost 70! Roy was a special character and had many friends at OWCC. Our thoughts are with Doreen, Colin and all the family. Roy’s funeral will be at Croydon Crematorium at 2.15pm on Friday 25 May followed by a reception at Addiscombe CC.